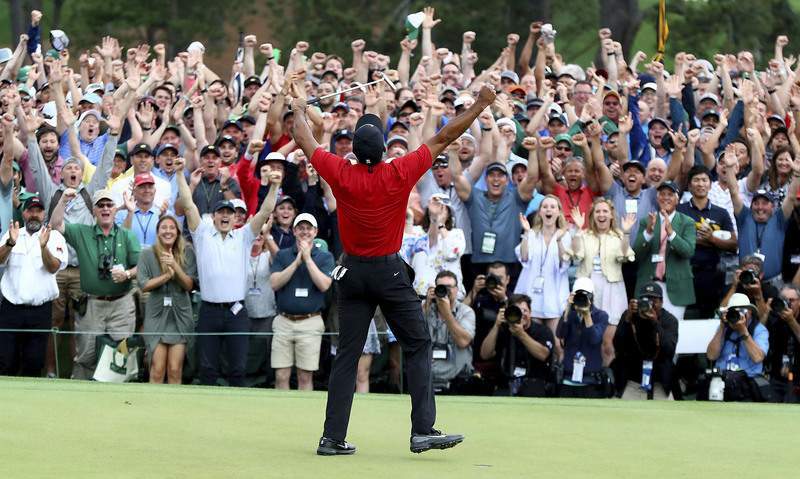 AUGUSTA, Ga. – They crowded hundreds deep around the 18th green, roaring when those lucky enough to be in front signaled the first sight of Tiger Woods in his familiar red coming up the fairway. Up by the clubhouse, the kitchen help stood in white jackets and hats, much like a previous generation did all those years ago. Few in the huge throng had any hope of seeing anything. But they could hear, and on this day that was enough. Off to the side of the green, the Woods children had a much better view. His daughter, Sam, was a year old when dad won his last major championship and son, Charlie, had yet to be born. 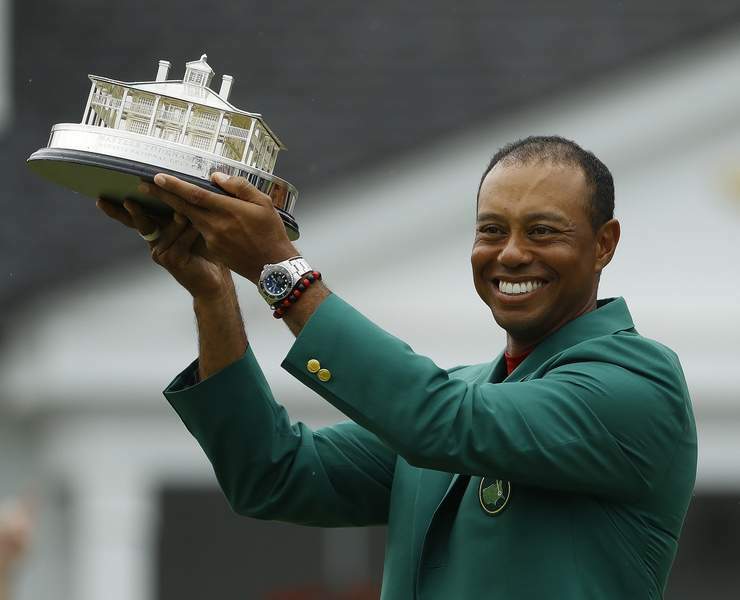 They had watched last summer as Woods tried desperately to break his major championship drought at the British Open, only to come up just short. “I wasn't going to let that happen to them twice,” Woods said. On a magical afternoon at Augusta National, there was no chance of that happening. 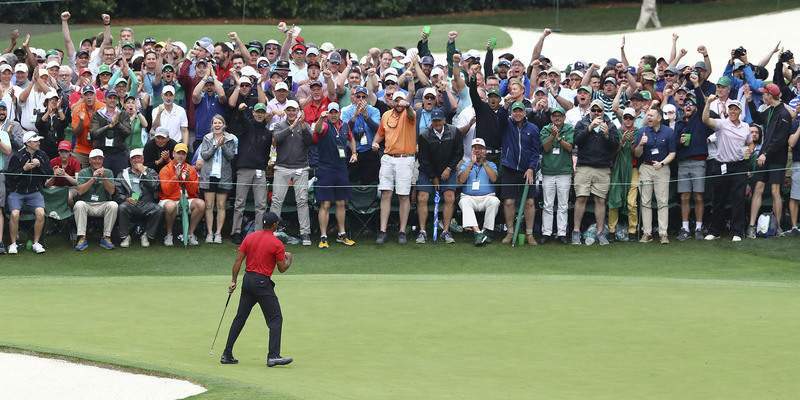 Woods didn't let them or any of his millions of fans around the world down on a day that will live in Masters lore, already thick with Woods' achievements. This wasn't his signature win from 22 years ago, when he was the young phenom who thrilled the country by romping to victory for the first time at Augusta National. But it seemed just as good, just as satisfying, both to him and the massive galleries that did all they could to try and will him to a win. 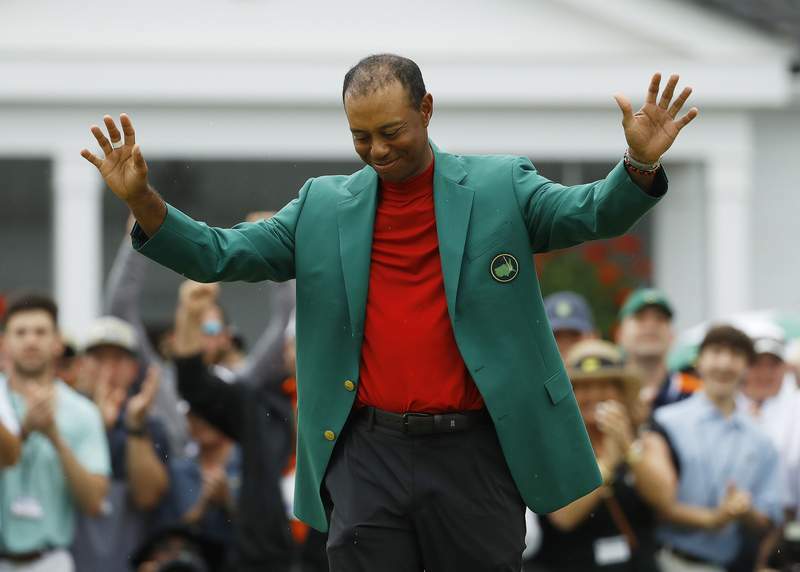 “To come back here and play as well as I did and did all the things – all the little things well this week, and to do it here,” Woods said, choking up at the thought. “This has meant so much to me and my family, this tournament, and to have everyone here, it's something I'll never, ever forget. He seized control of the tournament with near kick-in birdies on the 15th and 16th holes. That got him his fifth green jacket, but this meant more. So much more. All the doubt. All the doubters. All the issues no one ever expected Woods to have. America got up early to watch Woods try to win a major from behind for the first time, after tee times were moved up nearly six hours because of threatening weather. Woods grabbed the lead in Amen Corner when everyone around him seemed to be hitting balls into Rae's Creek. Then he held on for dear life as the birdies started pouring in from those playing in front of him. The key to his remarkable day, though, might have come after a 3-putt on the fifth hole that left him three shots behind Francesco Molinari, who had beaten him at the British Open in front of his kids. Caddie Joe LaCava had seen enough, and gave Woods a talking too on the way to the sixth hole. Woods called it a grind, and it was until his tee shot on the par-3 16th hole almost went in. It became a coronation on the final holes, as roars echoed as the inevitability of it all started to sink in. The crowd was thrilled, even those who had to listen to figure out what was happening out of sight. 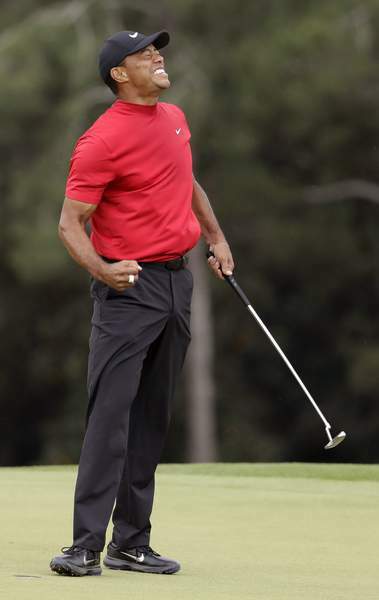 Woods himself screamed out in sheer joy after sinking his final putt, and no one could blame him. It had been a long, tortured path back to the top and the way it all ended at the place that he loves best couldn't have been scripted in a Hollywood movie. It had been 14 long years since his last Masters win. Eleven years since his last major championship. And now the question becomes not can Woods win again, but whether he can beat the record of 18 major championships set by Jack Nicklaus. The two fans Woods wanted to win for most were in his family. They got hugs from dad on the green, then walked with him through an opening in the crowd as chants of “Tiger, Tiger, Tiger” rang out. “I hope they're proud of their dad,” Woods said. Surely they are. But they're not alone. Tim Dahlberg is an Associated Press columnist. His columns appear periodically in The Journal Gazette.